As per the below post on Mr Hive & Kitchen Bar, beer can chicken cooking is an effective method to keep the internal meat moist. 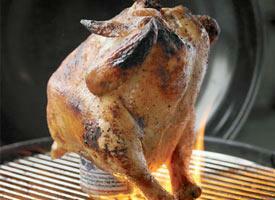 The beer liquid creates steam inside the cavity whilst maintaining a crispy skin exterior. Preheat your oven to 350 degrees. Remove the giblets from inside the chicken. Rinse the chicken in cold water and pat dry with paper towels. Mix salt, onion powder, garlic powder and black pepper to make a homemade rub. You can buy a meat rub instead of making your own. Line the baking pan with aluminum foil. Coat the chicken with vegetable oil and rub in the seasonings. Make sure to cover the entire bird. Pour out half the can of beer. Either cut the top off of the can or poke some holes in the top. Place the beer can in the middle of the baking pan and carefully sit the chicken on top. Position the chicken's legs so they are helping to support its weight on the can. Bake the chicken in the oven for 2 hours. Stick the the meat thermometer in the thickest part of the thigh. The chicken is done when it reads 180 degrees. Let the chicken rest for about 10 minutes before carefully pulling it off the can. Leave the lid on the pit for the duration, taking the lid off will extend the cooking time. I leave the lid on and forget about it, cooking 3 to 5 hours and they turn out wonderful.